The Pacific Palisades, Calif., home where Ronald and Nancy Reagan lived just before they moved to the White House is on the market. In the 1950s Ronald Reagan's best movies were behind him, but he still had enough charm to be asked to host "General Electric Theater," an early television anthology show. 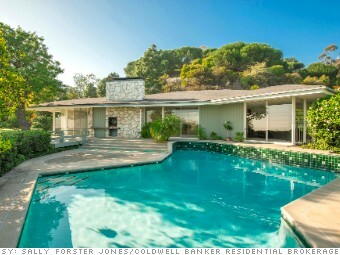 GE rewarded Reagan for the show's rating success with this 4,764 square-foot modern ranch house in the hills west of downtown Los Angeles. It was in this home that Reagan transitioned from actor to politician and later fielded the phone call from Jimmy Carter conceding the 1980 presidential election. Ronald and wife, Nancy, sold the home in 1982, after he moved on to his biggest starring role -- as the 40th president of the United States. Now this slice of Americana is up for sale again for $4.99 million, according to Sally Forster Jones of Coldwell Banker Residential Brokerage.